There seems to be a rash of New members here on the forum asking the same questions about how to do various things. I figured I would post this all in one easy spot to find so that the information is all in one place. (as i do not think it is currently localized anywhere except maybe in the thread index.) Maybe it can be stickied so that new members can easily find it. If you have corrections or additions, please PM me and I will make sure they get added. 1. How do I get a picture/avatar/symbol next to my name? 2. How do I get a title/rank by my name? 3. How do I get a signature under my posts? 4. How do I PM/Email/Contact someone from the forum? Last edited by Shadar Al'Niende; 07-07-2010 at 09:12 AM. How do I get a picture/avatar/symbol next to my name? Choose Save Changes at the bottom of the page. Congratulations!!! You have now Set your Avatar! How do I get a title/rank by my name? To get a title next to your name you must first choose something called a UserGroup. 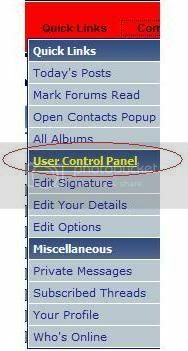 To do this, we will be opening the User Control Panel again. (see the above post.) and choosing Group Memberships from the menu on the left hand side. From there, you will need to select the group you would like to Join. By Default you are a Registered User, but can select from the Dark, Light, or Grey sides. Once you have selected your side by putting a mark in the corresponding bullet, click Join Group. Once you have Joined a group, you can then choose to be identified to the rest of the forum as a member of this group. (In other words get the fancy titles by your name!) To do this you must go to the bottom section and put a mark in the bullet next to the group you just added. (See image below.) Once this is done select Update Display Group. Congratulations!!! You now will have a title next to your name that corresponds with your Post Count. Last edited by Shadar Al'Niende; 01-27-2010 at 07:46 PM. How do I get a signature under my posts? Congratulations!!! 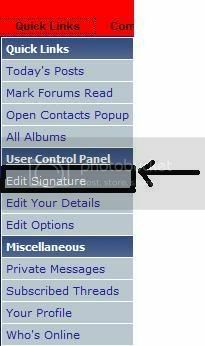 You should now have a Signature under your next posts. How do I PM/Email/Contact someone from the forum? You can click on anyone's name in a post to be taken to their profile. Alternatively you can look them up using the Community Link at the top of the index page found here. Once you find the Username you want, click on it to be brought to that Member's Profile. Below the user's name, you will a drop down titled "Send Message." From here, depending on what contact information they have added and your status as a FRM, you will be able to Post a Visitor Message, Send a Private Message (or PM), or Send an Email. Congratulations!!! You have now sent a message to the member you were trying to Contact! Great job Shad. We really needed that. Nice, I wish I had that When I joined! Also... TCSS Squadrons. They don't mean much. I used to have a "Red Leader" sig back in the day and it was cool to say who would be the others. We started to fill them out and whatever. So don't PM or e-mail me. It's more of a who's who back a few years ago more than anything else. Nice Post. Wonderful conversation to solve a question.